Dr. Wahid is an interventional cardiologist specializing in diagnosing and treating structural issues in the heart. By using catheter based treatments Dr. Wahid repairs and corrects heart conditions in adult patients at leading Dallas and McKinney hospitals. Dr. Wahid has been practicing interventional cardiology for over fourteen years. He is double board certified in Internal Medicine and Cardiology. 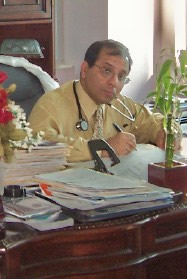 Dr. Wahid is actively involved in the advancement of cardiology through research and participation in clinical trials. Dr. Wahid is available at these hospitals and is diligent about seeing his patients in his clinic for one on one visits. He is well known by his patients for being accessible and spending the time needed to discuss treatment courses with patients. He can be found in the office all day on Tuesdays and Wednesdays and in the morning on Fridays. Dr. Wahid’s vision for his practice is to provide all encompassing care for his patients. Ultimately, a patient can be seen in the office and receive all inclusive treatment/testing the same day. This added convenience eliminates the need for multiple office visits and outsourcing to other facilities for testing purposes. He treats all patients personally and wants everyone to feel comfortable and secure while in his care. Cardiovascular health and the well-being of his patients is his number one priority. Everything about the Texas Institute of Cardiology, P.A. has been developed with the wants and needs of heart patients. Dr. Wahid insists on employing only the most dedicated, highly skilled, certified staff that is ready to provide quality care, assistance and education regarding cardiac health issues. Dr. Wahid feels that constant improvements only enhance the ability of his staff to provide an even higher quality of care. Professional development is mandatory as is CPR and first aid certification. Patients visiting TIC are always in a safe environment and cared for by highly trained/skilled professionals. The TIC staff strives to make every visit to the office as pleasant as possible.